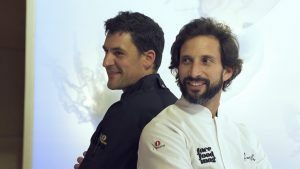 The chefs Óscar Molina (1 Sol Repsol) and José Avillez (2 Michelin stars) perfectly combined their cuisine at the La Gaia restaurant in the exclusive Ibiza Gran Hotel on April 27th. Óscar Molina, who with his concept of Peruvian and Japanese fusion, “Japeruvian”, has made La Gaia have its own unique identity signature style, wanted to have this year with the complicity of a great master of Portuguese cuisine and his team: the renowned chef with 2 Michelin stars, José Avillez (Belcanto Restaurant, Lisbon). As it is well demonstrated, the roots, philosophy and interpretation of the gastronomy of José Avillez and Óscar Molina go in the same direction, becoming perfection. The perfect idea. About 50 diners chosen, including food critics, authorities, media of Spain and Portugal and some friends who had the privilege of being able to taste a menu where the main ingredients were innovation, teamwork, technique, experience and creativity.